I was born in Wauchope NSW, Australia in 1952. Like most artists, my fascination with being artistic began at an early age. During my school days, art was not high on the "need to know" list of subjects. Basically, other than a bit of art history, how to create it was no taught. Back then, creating art was not considered a worthwhile school subject. In essence, being an artist was not considered an occupation. Being from a small country town, meant there were no art schools or art tutors nearby to help me with my art. So I decided to teach myself. It wasn't easy. There was a lot of trial and error involved as I endeavored to master the skill. As the years went by and I started my working life, my art time diminished quite a lot. I only dabbled here and there when time permitted. In the early 1970's I got interested in leather work. Particularly creating hand tooled pictorials on cow hide leather. I also learned how to do Pyrography during that time. Pyrography is the art of burning pictures into wood or leather, using a purpose made burning tool. In the early 1990's, I had opened a leather goods and art shop and operated it until 2000. Even though it was a successful venture, by the end of the 1990's, several circumstances came along that forced me to close the business for good. From 2000 to 2008, I created no art or craft whatsoever. In fact, I only got back into regularly creating art in 2008 by sheer chance, when a friend talked me into doing a painting for him. I loved it and I was back on my art journey once more. Up until that time, over the years, I had honed my drawing skills and had tried painting with several different mediums - oils, Watercolors and Gouache. All of them were frustrating, I finally opted to stick to using oil paints. However, in 2008, I swapped from using oils and started using acrylics. Mainly to speed up the drying time of my paintings. I wasn't too impressed with the tube acrylics so I decided to try liquid acrylics. The brand I switched to was Createx Colors. They were very good and the really exciting part of my painting journey evolved. At this point I made another change. I stopped painting on boards and started painting on stretched canvas. It was another milestone of my journey. Near the end of 2008, I changed to painting, using Createx Wicked liquid acrylics. Today, they are the only acrylics I use. I am now a full time artist. My art style is referred to as high detail, realism. My chosen subjects to paint are animals. If it's got fins, fur or feathers, I'll paint it. I focused on the level of detail I wanted to achieve and it worked. I now enter a lot of art exhibitions and I have been quite successful over the past few years. I have won quite a few art awards. Even though it has been a roller coaster ride over the years, I never really lost my desire to be creative. It just needed the right time and place to come to fruition. It's been quite a ride. Rockwell is regarded as America's greatest illustrator, his paintings could tell a story in one picture. 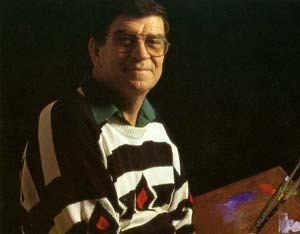 D'arcy Doyle (1932 - 2001) - a master at capturing the essence of Australian life and landscapes.